Meredith was certainly inspired to contribute to the Haggis and the Herring during my visit to Toronto. After making the Almond Pear Tahini Cake, from the "Saved by Cake, over 80 ways to bake yourself happy" recipe book by Marian Keyes, she decided to give it a go with a second recipe. This time a tart from the same book. What's the twist this time? Chili and cardamon! I've heard of chili chocolate, but not with the cardamon spice typically used in Mediterranean cooking (One of my brothers favourite types of food). This was my first time actually trying a chili chocolate and the recipe Meredith used did a great job at balancing the flavours of sweet and spice. Meredith also did a fantastic job at getting such a smooth texture out of the tart. 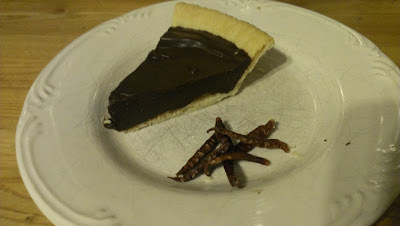 My wife Amanda has Celiac Disease, so before Meredith placed all the filling in a pie shell, she put some aside for Amanda in a shot glass as a second way of presenting this dessert (Unfortunately I forgot to take a picture of that). I wouldn't eat those chillis straight if I were you. Chop the chili finely and toss the seeds and grind the cardamom pods. Put the cream, sugar, cardamom pods and chopped chili into a saucepan and gently bring to a simmer. Stir and heat until the sugar has dissolved without burning. Reheat the cream mixture until simmering, then put the chocolate and butter in a heatproof bowl and strain the warm cream on to it through a sieve, leaving the cardamom and chili behind. The heat of the cream should melt the chocolate so stir until mixture is smooth. Pour into the pastry case and let cool for a several hours. The texture should settle to be smooth and fudge like.